Crouse, Jeffrey. "Letting His Wish Provide the Occasion: Fred Astaire in Top Hat", Film International, No. 5, 2003. The Astaire Family Papers, The Howard Gotleib Archival Research Center, Boston University, MA, U.S.A.
^ 1.0 1.1 1.2 1.3 Billman, Larry. Fred Astaire – A Bio-bibliography. Connecticut: Greenwood Press. 1997. ISBN 0-313-29010-5. ^ Fred Astaire (1899-1987) aka Frederick Austerlitz. Hyde Flippo. [2008-08-24]. （原始内容存档于2009-01-02）. ^ The Religious Affiliation of Adele Astaire. Adherents. 2005-09-20 [2008-08-24]. ^ Garofalo, Alessandra. Austerlitz sounded too much like a battle: The roots of Fred Astaire family in Europe. Italy: Editrice UNI Service. 2009. ISBN 9788861784154. （原始内容存档于2011-07-22）. ^ Levinson, Peter. Puttin' On the Ritz: Fred Astaire and the Fine Art of Panache, A Biography. St. Martin's Press. March 2009: 1–4. ISBN 0312353669. ^ Satchell, p. 8: "'Fritz' Austerlitz, the twenty-three year-old son of Stephen Austerlitz and his wife Lucy Heller"
^ Astaire, Fred. Steps in Time. London: Heinemann. 1959. OCLC 422937. ^ The Statue of Liberty – Ellis Island Foundation, Inc.
^ Melissa Hauschild-Mork. Fred Astaire. [2008-06-09]. （原始内容存档于2008-05-27）. See also Swing Time. ^ e.g. Croce, 1st edition, 1972, footnote p. 14, removed at Astaire's request in 2nd edition, 1974, – see Giles (p. 24). Satchell pp. 41-43 claims to have detected their presence as extras "Even with the benefit of an editing machine, slow-motion, and stop-frame, the Astaires are almost lost in the mass of bodies"
^ Astaire p. 42 and Billman p. 4: "They observed the filming as visitors but insisted they did not appear in the film." 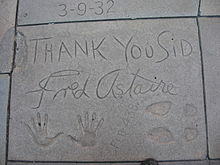 ^ "The cast may also have included Fred Astaire, then sixteen, and his sister Adele. There is no proof of this, and they do not surface in surviving reels." — Brownlow, Kevin. Mary Pickford Rediscovered. New York, New York: Harry N. Abrams, Inc. 1999. ISBN 0810943743. ^ Astaire p. 65: "We struck up a friendship at once. He was amused by my piano playing and often made me play for him." ^ 17.00 17.01 17.02 17.03 17.04 17.05 17.06 17.07 17.08 17.09 17.10 17.11 17.12 17.13 17.14 17.15 17.16 17.17 Mueller, John. Astaire Dancing – The Musical Films. London: Hamish Hamilton. 1986. ISBN 0-241-11749-6. ^ Betsy Baytos. Footage from the Fred Stone Collection of the Broadway show Gay Divorce (1933). Fred Astaire: The Conference. The Astaire Conference. [2008-05-14]. （原始内容存档于2015-06-02）. ^ Astaire made the comment in a 1980 interview on ABC's 20/20 with Barbara Walters. Astaire was balding at the time he began his movie career and thus wore a toupee in all of his films. ^ 20.0 20.1 Croce, Arlene. The Fred Astaire and Ginger Rogers Book. London: W.H. Allen. 1972. ISBN 978-0-8109-4374-2. ^ Hyam, Hannah. Fred and Ginger — The Astaire-Rogers Partnership 1934-1938. Brighton: Pen Press Publications. 2007. ISBN 978-1-905621-96-5. ^ e.g., the songs "I Am Fred Astaire" by Taking Back Sunday, "No Myth" by Michael Penn, "Take You on a Cruise" by Interpol, "Fred Astaire" by Lucky Boys Confusion, "Long Tall Glasses" by Leo Sayer, "Just Like Fred Astaire" by James, "After Hours" by "The Bluetones", "Fred Astaire" by Pips, Chips and Videoclips, "Decadence Dance" by Extreme, and appeared on the cover of The Beatles’ Sgt. Pepper's Lonely Hearts Club Band album. ^ Thomas, p. 135: "I'd love to have been able to do more with my music, but I never had the time. I was always working on dance numbers. Year after year I kept doing that. Somehow or other I always blame myself, because I say, 'Well, I could have found the time; why the hell didn't I do it?'" ^ Kathleen Riley. Fred Astaire Conference Flyer (PDF). The Astaire Conference. 2008 [2008-05-14]. （原始内容 (PDF)存档于2008-04-14）. ^ Astaire, Steps in Time, p. 8: "At the risk of disillusionment, I must admit that I don't like top hats, white ties and tails. ^ Niven, David: Bring on the Empty Horses, G. Putnam 1975, p. 248, 255: "The combination of Fred and Phyllis was a joy to behold...Theirs was the prototype of a gloriously happy marriage." ^ Billman, p. 22: "Astaire's intense professionalism — and the memory that Phyllis had wanted him to make the film — made him report back for work. The first few weeks were difficult, with most of the time being spent on Leslie's ballets and requiring as little as possible from the grieving man. Caron remembered, "Fred used to sit down during a rehearsal and put his face in his towel and just cry." ^ AVA ASTAIRE MCKENZIE 互联网档案馆的存檔，存档日期2009-01-12. ^ Satchell p. 254. Billman (p. 26) believes Astaire couldn't countenance the portrayal of his first wife, who suffered from a speech impediment. "Fred Astaire and the art of fun": an essay on the Oxford Fred Astaire conference from TLS, July 16 2008.